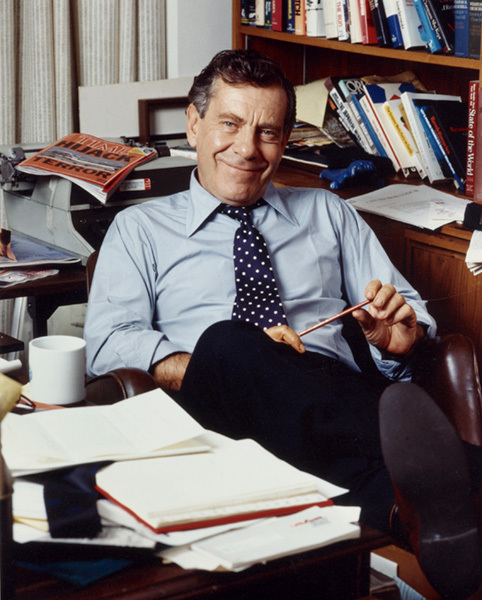 Morley Safer. 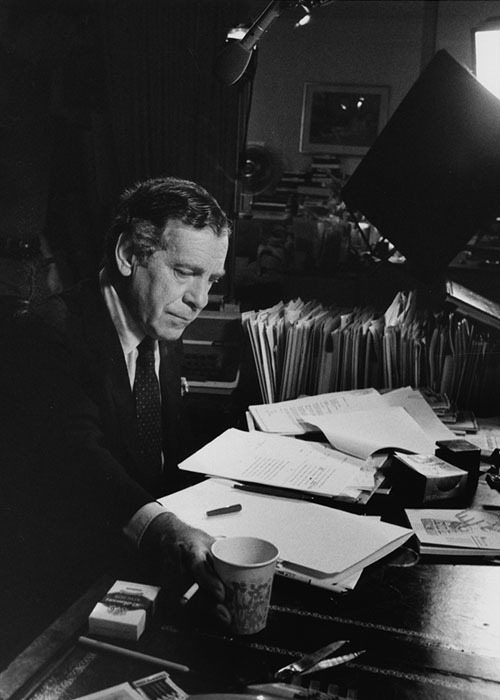 Morley Safer Papers. Briscoe Center for American History. Safer was born in Toronto, Canada, in 1931 and began his career at newspapers in Ontario. At the CBC (Canadian Broadcasting Company) he became a news producer in the new medium of television. Later he worked as a foreign correspondent, traveling the world reporting from hot spots like Berlin, Cyprus, Algeria, and the Congo. After joining CBS News in 1964, Safer was sent to cover the Vietnam War. His reports helped change American perceptions about the U.S. role in Vietnam. His most notable broadcast was from the village of Cam Ne, where he witnessed U.S. Marines burning a village of thatched huts that housed only women, children, and elderly men. The broadcast infuriated President Lyndon Johnson, who pressured CBS to remove Safer from the war zone. To this day, Cam Ne remains a case study of incisive war reporting, which New York University cited as one of the most important news pieces of the 20th century. Beyond Vietnam, Safer built his reputation as a journalist unafraid to tackle the world’s trouble spots in all their complexity and ambiguity: Ireland, Biafra, the Middle East, and many more. For his 1967 CBS documentary, Red China Diary, Safer, thanks to his Canadian passport, was able to gain rare access to China at the height of the Cultural Revolution. Safer later told the Canadian press that he felt “stateless,” which he believed benefited him as a reporter. I bring a different perspective and have no vested interests. . . . It is not a matter of loyalty, but of integrity. In 1970 he joined a new venture called 60 Minutes, with the proviso that he could return to his post as CBS London Bureau Chief when the program was taken off the air. He remained in that job for the next 46 years. For more than four decades, Safer’s boundless curiosity, consummate storytelling, and mastery of language were on regular view in the 919 stories he did for 60 Minutes. Profiling international heroes and villains, exposing frauds and corruption, and giving voice to whistleblowers, he asked the tough questions, often with a smile. He resisted conventional interpretations and found many of his best stories where no one else bothered to look. His stories defied the customary categories. He valued the elegance and simplicity of a great line without ever sacrificing depth and reveled in the challenge of marrying wit to accuracy. 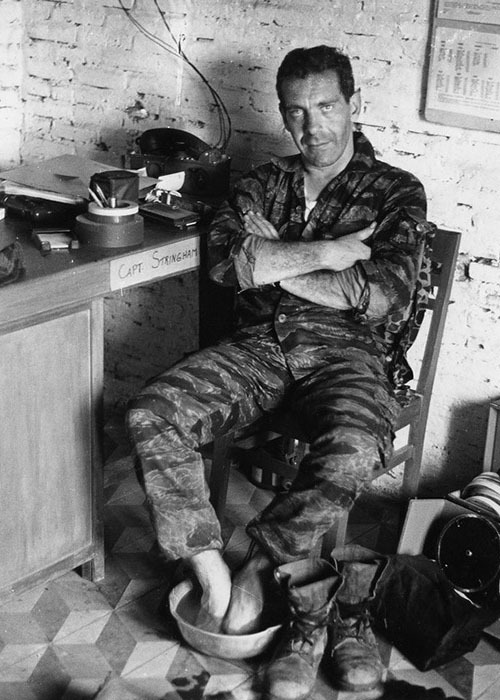 Morley Safer on location in South Vietnam, circa 1965. Alex Brauer/CBS via AP. Morley Safer Papers. Briscoe Center for American History. 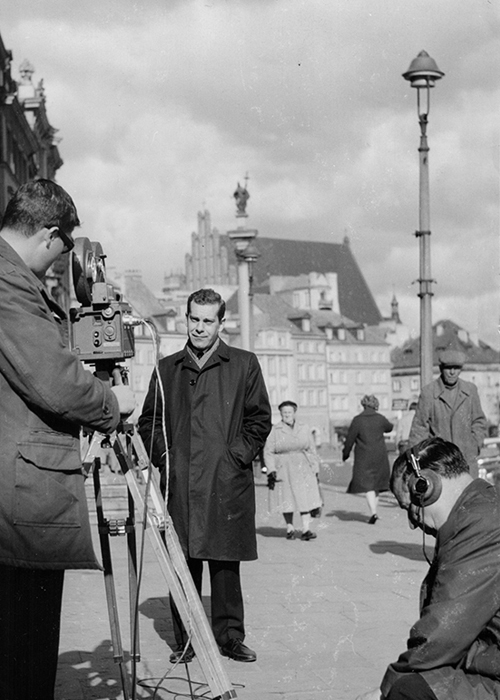 Morley Safer on location in Warsaw, Poland for Canadian Broadcast Company, circa 1960. Courtesy of Jane Safer. 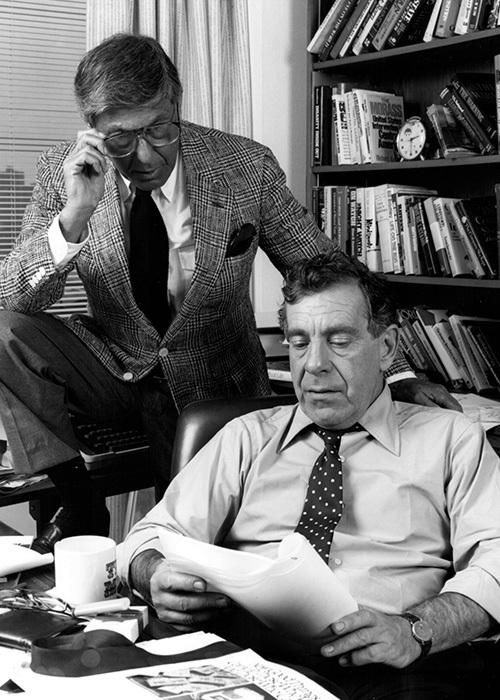 60 Minutes creator, Don Hewitt, and correspondent, Morley Safer. Courtesy of Jane Safer. His rigorous reporting was exemplified by a 1983 piece entitled “Lenell Geter’s in Jail.” Lenell Geter, a young black engineer convicted of armed robbery in Texas, was serving a life sentence. Safer’s extensive investigation found new evidence that exposed a sloppy and biased investigation that had led to a wrongful conviction. Ten days after the segment aired, Geter was released from prison. In his years at 60 Minutes, Safer became known for stories that were offbeat, often droll, and always wonderfully written. “At 60 Minutes he developed a new way to tell stories for television,” noted his 60 Minutes colleague Steve Kroft. “He was an original voice. There has never been one quite like him.” No matter how apparently obscure, these idiosyncratic stories offered broad resonance and unexpected insights. Neither pictures nor words dominated his pieces. “He trusted that word and picture could serve each other,” said former 60 Minutes producer John Marks. What made Morley unassailably unique was the way he combined word, picture, history, and reportage into a singular vision. Safer profiled giants in politics and the arts; from Richard Nixon to Syria’s President Assad to John Kerry; from Luciano Pavarotti to Meryl Streep to Miss Piggy. He also introduced us to many who were less known, but equally fascinating: the Antinori family, whose 700-year-old winery is Europe’s oldest business; unsung heroes, like Navy Captain Grace Hopper, who pioneered computing in the 1950s; a prisoner of a Nazi death camp who escaped the gas chambers by playing in the Auschwitz orchestra; and the autistic savant who inspired the movie Rain Man. Safer was able to transport the viewer to remote corners of the world to observe such sights as Finland’s national obsession with tango; the peculiar mix of cowboys and artists in the isolated Texas town of Marfa; the Kingdom of Bhutan’s pursuit of GDH, Gross Domestic Happiness; or the remote island in the Maldives where the government had exiled a young German as punishment for murder. 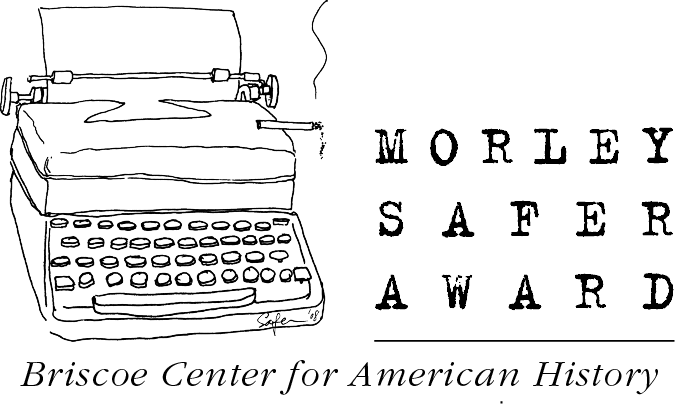 Safer won every major award given to broadcast journalists: four duPonts, two George Polks, three Peabodys, three Overseas Press Club awards, the Paul White, the Robert F. Kennedy prize, the Fred Friendly First Amendment award, and 12 Emmys. The French government named him a Chevalier dans l’Ordre des Arts et des Lettres. Safer died in May 2016 at the age of 84, one week after officially announcing his retirement. “His writing is the best in the business. His toughness and kindness and sense of humor are legendary,” said Steve Kroft. He’s always had humor, authenticity. And a sharp eye for the absurd. . . . Simply by example, he’s made the rest of us better journalists.